NOTE: This post was originally published on April 20th, 2011. 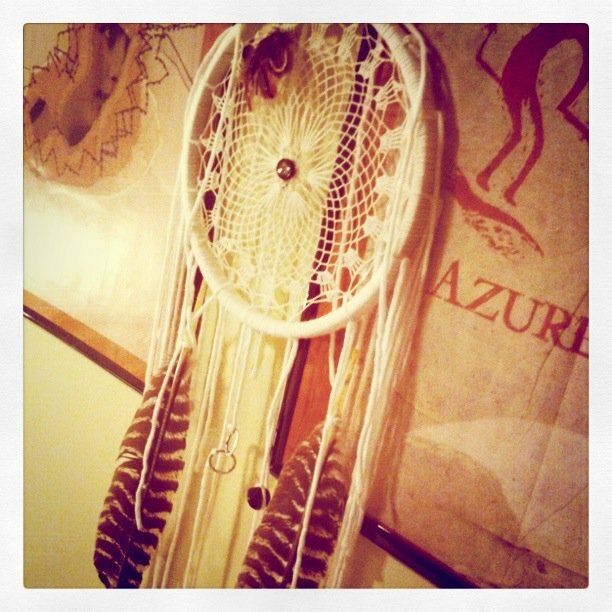 Instead of the traditional dream catcher style method of wrapping a loop with leather lacing (see here how to create a traditional dream catcher), I covered the metal hoop with a multi colored light weight yarn. 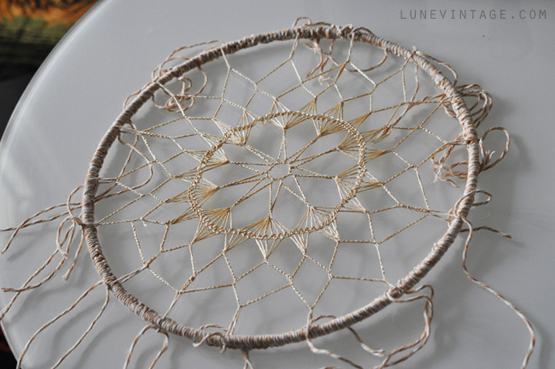 One way to do this would be tying, gluing and then carefully wrapping the hoop. 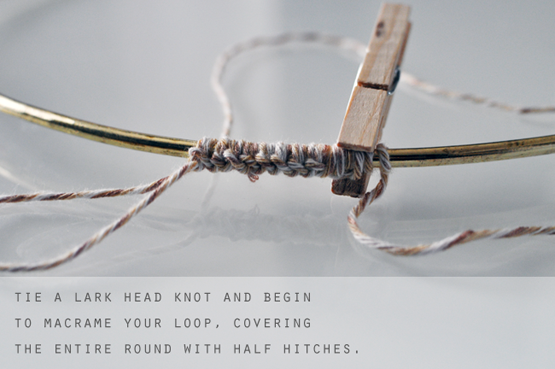 If you are familiar with macrame lark head and half hitch knotting techniques, you can cover your loop as I have in my example. I like these knots because they give one braided side, and one wrapped side to the loop, and act as one long tube to securely cover the entire round. Knotting the loop took about 20 minutes in total. Here's a video I made to show you how I did it - watch HERE or visit our sidebar for the video tutorial section. 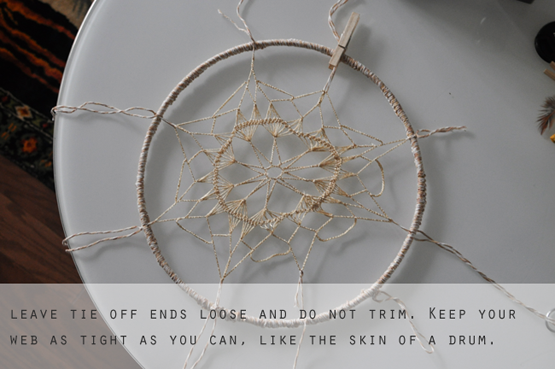 If you've used a knotting method to cover your loop - make sure the braid is straight and decide which side will be the face of your dream catcher. Knot a loop in the yarn (or leather if you decide to wrap it with lacing) to act as the top, and a place to eventually hang on a nail. 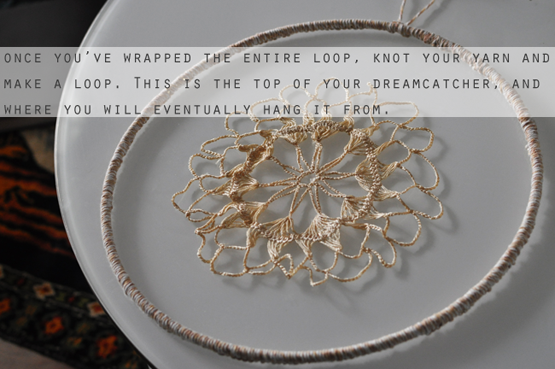 Lay your doily in the center of the hoop to decide which way is up. Notice how small the circumference of the doily appears in relation to the hoop? Tricky right? Now you know my shortcut...did you think i knotted all that fancy star shaped magic? Nope. And all it cost was 10 cents. Time to start browsing the doily bin. 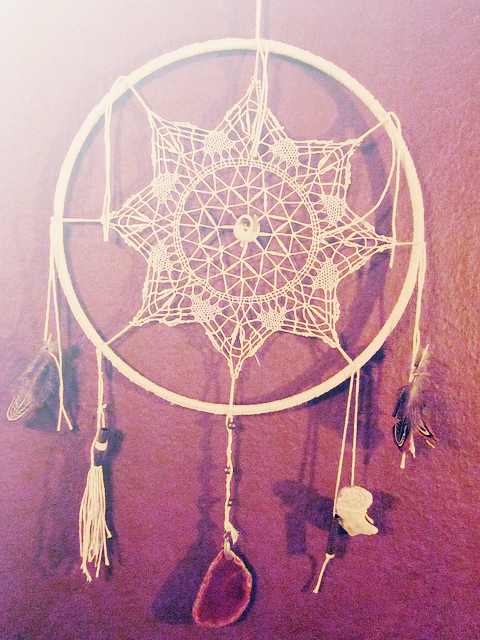 It's time to start stretching and tying the web of your dreamer. This is the really fun part - but if you allow the web to go slack, you'll be disappointed with the final result. Work across from each other in quadrants. Think north, south, east, west, and divide evenly until there are no sagging areas. If you find half way through that your initial tie offs are a bit slack, cut them and re-tie. I also left all ties with two loose ends dangling. These ties are what secures the adornments you will add in the final stage of the project. Remember while tying - keep that web taught! 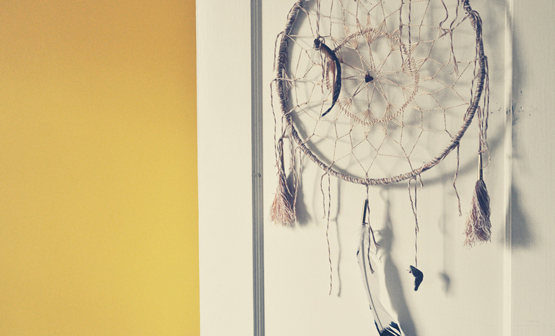 Finally, once all loose areas have been pulled and tied tightly, your web will be tight and ready to decorate. 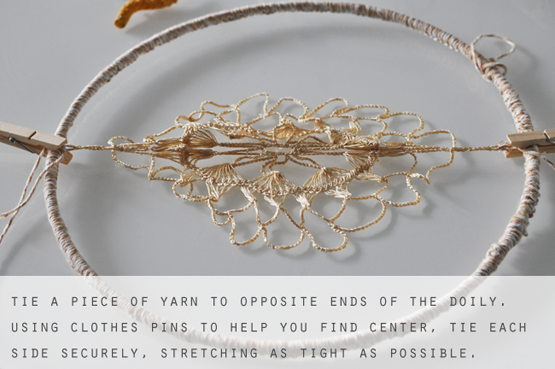 Using a lace crocheted doily like this one provided me with an instantly intricate design that would have been beyond my capability in creating - but in using similar fibers and colors, blends almost seamlessly into the project. 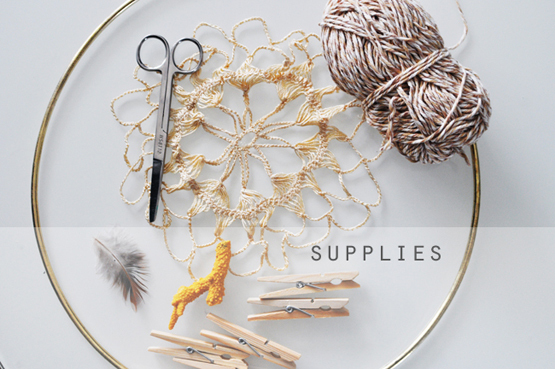 consider dying doily to match the yarn, or immersing the finished product in a dye bath before adding embellishments. If doing this, be sure that you are using natural fibers of similar content. Synthetics require special acid dyes and heat methods, so stick to natural cold water baths if possible. scout doilies which are more lacy, not starched, and on the thin side. Thick stiff ones will not give you the stretched effect as they will not expand or contort into a natural web-like shape. 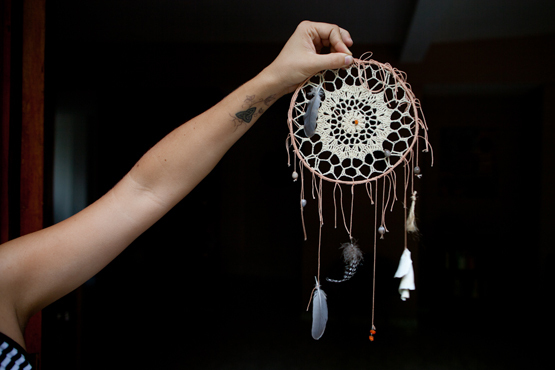 I created another dreamer, this time with a beautiful piece of lace. 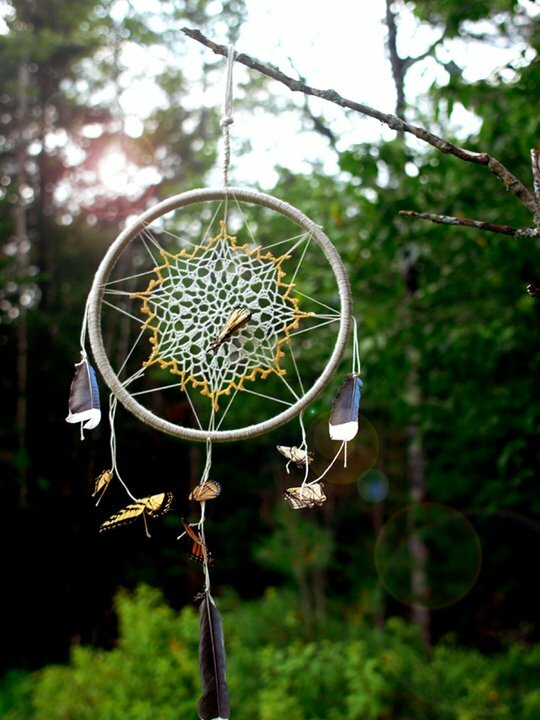 Visit the lace - feather - stone dreamer for some details on how to use a tapestry needle to achieve this effect! 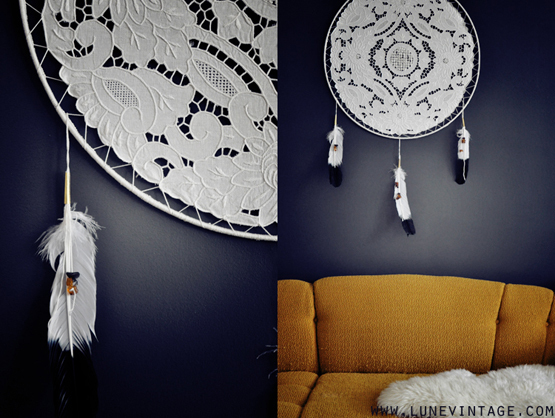 Did you like this Lune DIY? I hope you do! 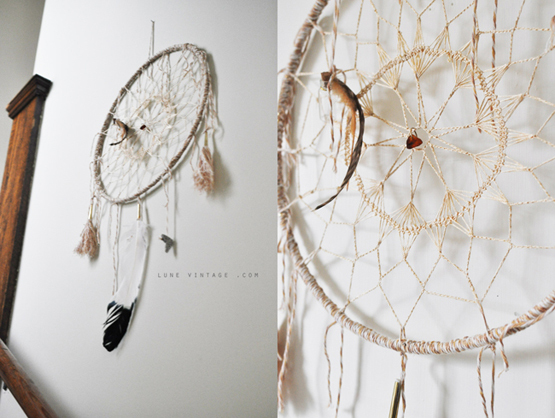 If you decide to create one for your own home, or someone you love, please send me a picture at lunevintage@gmail.com. I'd love to share your take on this project. 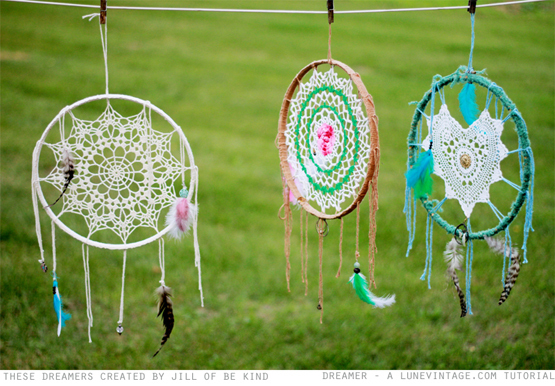 Here are a few more ideas sent in by Lune readers who did this tutorial themselves! Beautiful! This reader was living and working in Haiti, all her supplies were found from the beach and markets there. The blue jay feathers and butterfly wings were found on the forest ground and used in this star shaped dreamer by artist Bethany Bond. Beautiful!